The Canon EF 28-300mm f/3.5-5.6L IS Lens covers a large focal range within a smaller, hand-holdable form factor and sports (to some) a more intuitive push/pull design. The push/pull design offers a unique approach to zooming, which some photographers find to be quicker than standard internal zooming. The zoom barrel also has a zoom position index printed on it so that you can quickly zoom to a particular focal length. It also has a tension ring for customized zoom torque. The Canon EF 28-300mm f/3.5-5.6L IS can be paired with both full frame sensor cameras, such as the Canon 5D Mark III, and with crop frame sensor cameras, such as the Canon 7D Mark II. The focal length equivalent on crop frame sensors is 45-480mm. Note that, unlike the Canon 100-400mm f4.5-5.6L IS, which is similar in build, the 28-300mm is NOT compatible with 1.4X or 2X extenders. This lens is ideal for events, thanks to its very forgiving focal range that allows you to shoot from the bleachers and up close without having to switch out lenses. It is particularly well suited to outdoor events because the aperture only opens to f/3.5 at the widest ranges, which may not be fast enough for low-light situations. However, the built-in image stabilization helps when shooting indoors. • This lens is compatible with Canon EF mount cameras in both full frame and crop frame sensors. The focal length equivalent on crop frame sensors is 45-480mm. • This lens is NOT compatible with 1.4X or 2X extenders. 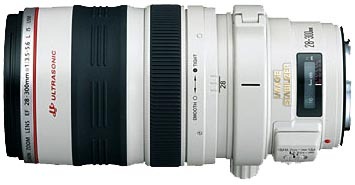 • Like the Canon 100-400mm f4.5-5.6L IS, this lens has a push/pull design for changing the focal length. For more information on how to operate, see this manual.